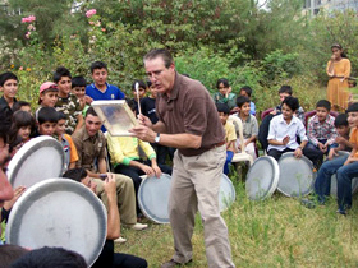 Dr. Woodson has served as Musical Ambassador in Iraqi Kurdistan and in Indonesia. In the play-along approach, Dr. Woodson has carefully designed ‘composite’ instruments that produce considerable sound quality, that represent the main sound families of the orchestra, and are easy to make and play. He has devised a way of conducting the audience from the stage with a series of large sign boards and large conducting dots. In the end, students are able to take away the experiences of listening to an orchestra and of playing along in a synchronized way. In addition they are led by a conductor and in certain sections have fun improvising. ORCHESTRAS. This program concept was picked up by many orchestras in the 1990’s, one being the National Symphony Orchestra, where 25,000 students made instruments for 10 concerts with the Orchestra. For these events, Dr. Woodson produced a video for schools describing how to make the instruments; it went out to 400 schools for teachers to help make the instruments in advance of concert. Students later came to the Kennedy Center to attend a National Symphony concert and during this event, took out their instrument and played along with the Orchestra on a specially commissioned work. Many other orchestras have hired Dr. Woodson to present his play-along family concerts.